Jan. 1, 2009 - Happy New Year! Still keeping up with my workouts -- lifting weights and cardio (walking and/or running)! Will post a current photo soon! Been tired lately, wanting to nap during the day and sleep in in the mornings. Of course, the first thing I worry about is the return of colon cancer. I'm not going to worry about it too much until I learn otherwise. I have my annual CT scan and bloodwork scheduled for January 29th and will post the results soon thereafter. CT scan and blood work came back clear of cancer! I am officially a three-year colon cancer survivor today. Yeah! However, I will have to have a colonoscopy sometime next week; one year early for this procedure, due to some back-up in the colon, if you know what I mean. Today is the day I start my all-clear-liquid diet and 3:00 p.m. colon-cleansing treatment of Golytely (pronounced go lightly). I'm having a colonoscopy scheduled for 10:45am tomorrow. Apparently, my cancer-removal surgery (hemicolectomy) in 2005 left a portion of my colon much too small for things to pass through without build-up. So, I will be cleaned out tomorrow, and if possible, the doctor will try to enlarge this area of my colon by lasering off some of the scar tissue. If the lasering cannot be done during the colonoscopy, I will have to have surgery to revise the colon resection. Ran 4 miles earlier today in 46 minutes! This is terrific news for me, considering (1) I have not ran 4 miles since early last year and (2) my best 4-mile run time was 48 minutes. It's 1pm, and so far today, I have had 2 cups of coffee (no milk allowed) and one cup of green tea. I'm hungry! Wonderful news! Last Tues., my colonoscopy revealed that I did not in fact have a stricture. Rather, the muscles are no longer constricting in that certain section where my colon was resectioned. In other words, that portion is no longer able to move things through the colon. I now have to take a dose of Glycolax (or Miralax) every day. Aside from the daily laxative, I do not have to worry about further surgery or a colonoscopy for another five years. The gastroenterologist did find and remove three polyps, all of which he believes are benign. Biopsies were sent to the lab. I should get the results sometime next week. I've been ramping up my once-a-week "long" running distance from 2.5 miles to 4 miles, and then running twice more during the week for at least 3 miles each time, with an average speed of between 10.5-and-11-minute miles. This morning, I ran 5 miles for the first time in over a year! Not too proud of my finish time of 75:00 (15-minute-miles), but 1) I finished and 2) I'm feeling fine! My youngest sister, Gina, invited me to participate in a St. Patrick's Day 5K/10K race on Sun., March 22nd. I've never ran a race, and Lord knows I won't be running for time, but I think I'll give it a try. OK, I want to let you know that although I felt fine right after my 5-mile run last Friday, my left hip was really bothering me the next day, to the point of limping after being in a sitting or lying position for an extended period of time. I asked my doctor if there is anything I can do to alleviate the pain from osteoarthritis (bone-to-bone arthritis in the hip due to my past chemo treatments), and she recommended glucosamine-chondroitin. Unfortunately, one of the ingredients in the supplement is shellfish to which I have an allergy. The only thing I can take for the pain is 800mg of ibuprofen, the equivalent of a prescription dose. I'm too young to get a hip replacement, but it is possible that I will have to opt for it in the future. My doctor also recommended that I look into other forms of aerobic exercise such as brisk walking, biking or swimming, all of which are low-impact. There's nothing wrong with low-impact exercise. In fact, I was an AFAA-certified group exercise instructor and taught step-aerobics! However, I am completely hooked on running and feel that I am just "warming up" to the sport! So for now, I'll continue to run, take the 800mg of Ibuprofen and try not to whine so much about the pain. I have never snow-skiied but have always wanted to do so. I leave for Snowshoe, West Virginia exactly one week from today. Whoo-Hoo! I'll be going with a dozen people, to include my husband, daughter, sister, bro-in-law, niece, and brother. Bought ski pants, goggles, ski gloves, thermals (non-cotton) and ski socks (extra padding). I already have a nice ski jacket, turtlenecks, hats and boots. Well, the jacket is on the "puffier" side, not as slimming as I would like to have for skiing, but I am not going to buy another jacket for my first time skiing. If I don't get the hang of skiing even after daily lessons, I would like to at least look like I know how to ski. Hahaha! Did the same thing when I started taking golf lessons several years ago--I sure looked good with my hair pulled back in a ponytail; pink, blue or white polo shirt, white or tan capris and white golf shoes and glove. But I can hardly call myself a golfer! I am in love with skiing! Dreamt about it for several days after getting back from our trip to Snowshoe, WV. Started with a class on the bunny slopes and ended that day doing three runs on three separate Greens! 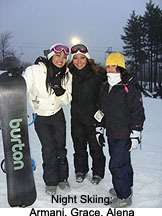 Went skiing all day the following day and also did night-skiing with David, daughter Armani and our niece Alena. We are already planning our family ski trip for next year! And Armani & I will go with our very own skis, snowboard & ski/snowboard boots! I beat my 5K personal best (see below) with 32:48 (10:33 min./mile), placing 10 out of 21 in my age group and 66 out of 137 in the women's division @ the St. Patrick's Day 5K/10K Race this past Sunday! Sat., April 25, 2009 - Happy Spring! Results from yesterday's semi-annual blood work and CT scan are negative for colon cancer recurrence! Oncologist congratulated me with great news for the next semi-annual medical procedures: I can skip the colonoscopy! Happy upcoming holidays! So much to do, so little time! Today, there's a cold front with a "high" only in the 60's and a low of upprer 40s. Brrr! It's 8:30 p.m. and 57-degrees right now. I went outside and my fingers are numb, from the tips to the third (bottom) knuckle. It's hard for me to type on the keyboard right now. And 2 hours ago, I got major jaw spasms when I took my first bite of dinner of 3 oz pork tenderloin and roasted brussel sprouts. It's been four years since my last chemo treatment, so I believe my neuropathy side effects from chemo will be with me for life.Hair and nails are growing at a rapid rate. I have to file down my nails every three-to-four days and I think it's time for a partial highlight throughout my crown. Time to call my hair dresser!